Wet plate photography was thought to be invented in 1851 by Frederick Scott Archer. The Wet Plate Collodion photographic process followed and all but replaced the Daguerrotype. Unlike the earlier process, Wet Plate was portable, less expensive and less toxic, allowing itinerant photographers the ability to travel around making portraits. 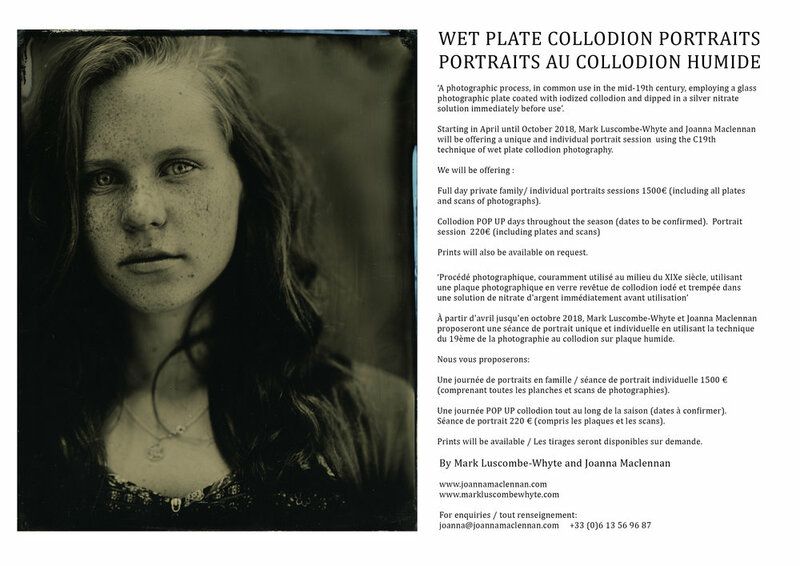 I rediscovered wet plate a couple of years ago at a village fete in Pernes la Fontaine, and realised that this was what had first attracted me to photography as a teenager, after seeing an exhibition on Julia Margaret Cameron. This recently led me to buy the camera below. I posted this on Instagram which led me to meeting the very talented and inspiring Mark Luscombe Whyte who has been teaching me the process. We have already been involved in some interesting portrait sessions. We started working together last year and will once again be offering wet plate portraits from April 2019 until around October 2019. If you are interested please contact myself or Mark directly. More information below.